This program is NOT for teenagers that have been institutionalized, rather, it is for young men who may be headed in a dangerous direction. If a parent's goal is to get their teen "On Track" before it is to late, this may be the start of a great "switch" in direction. The Switchback program is uniquely designed to mingle adventure and outdoor skills with character building, leadership training, team work, and most of all, a closer relationship with The Creator. The program is aimed at helping teens see the need for a "switch" in direction and to equip them with the tools necessary for making wise life-choices. During this multi-week adventure, campers will be faced with practical and Biblical instruction to help them understand the role that God has for leadership in their lives. The Switchback program is bathed in fun and excitement and is designed to help the camper to enjoy his stay, all while setting on course a vessel fit for the Master's use. Campers are removed from their day to day schedule and placed in a controlled environment where they are isolated from their regular comfort zones. This allows for a "reality check" and produces an awareness for what is really important in life. It can also provide a new-found appreciation for what God has already blessed them with. The goal is to guide them to a place where they recognize the need for a change and begin to desire a healthy direction in life. In addition to setting young men on track. 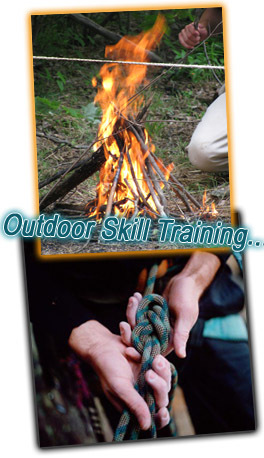 The Switchback program is an action packed, multi-week introduction to survival in the remote Appalachian forests. We have two Switchback programs from which to choose, each with the same goals and objectives, a different length of stay (13 or 20 days), and a unique structure and scope. Read below to determine what program is best suited for your son. entering the 7th - 12th grades. The Switchback13 program is two, back-to-back weeks of intense character training, bathed in fun and adventure. Many times a quick reality check and an intense instructional environment is all that is needed to correct a dangerous course. An individual breakdown of the 13 days can be found below. Why choose the 13 day program? *Many young people can not get away for 20 days. * Campers get a short reality check, without an extended stay. * This program is more affordable then the 20 day. * It is fast paced with next to no breaks in schedule. * It is bathed in fun and adventure. This adventurous program includes hiking, backpacking, outdoor cooking, climbing, fire building, shelter building, high and low ropes course, canoeing, rappelling, and much more. This fast-paced, exciting adventure is a wonderful tool to teach and prepare teens for life. Immersed in fun, campers will learn obedience and respect while learning to work together with others. Each camper will have the opportunity to try their skills on our low ropes course, our zip line, as well as participate in a variety of team challenges. This camp is for boys entering the 7th - 12th grades. The Switchback20 camp is our premier program aimed at correction change. The 20 days allow enough time for campers to not only recognize the need for a change, but also begin the process of restructuring choices, thoughts, attitudes and their relationship with God. The last 5 days of the program are aimed at encouraging and rewarding the accomplishment of set goals. One of the goals for the young men that week is to complete a 30 mile adventure trek on remote wilderness trails and waterways. Why choose the 20 day program? * Sometimes 13 days is not enough time to rebuild. * The speed and schedule of the program slows more each day giving the camper time to think and meditate on the approaching return back home. * This program includes a 30 mile Adventure Trek. * The program does not completely surround around fun. * The program concludes with a Parent/Camper picnic and graduation allowing for a significant opportunity to strengthen relationships. This adventurous program includes hiking, backpacking, outdoor cooking, climbing, fire building, shelter building, high and low ropes course, canoeing, rappelling, and much more. This fast-paced exciting adventure is a wonderful tool to teach and prepare teens for life. Immersed in fun, campers will learn obedience and respect while learning to work together with others. Each camper will have the opportunity to try their skills on our low ropes course, our zip line, as well as participate in a variety of team challenges. This camp is for boys entering the 7th - 12th grades. The goal and aim of the 13 day and the 20 day programs is to help teenagers see the need for a "switch" in direction. Each day of the program is specifically designed to build upon the previous day. Does your teenager need improvement in any of these areas?